Where to find Eganville hotels near an airport? 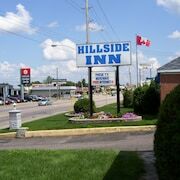 Where can I find hotels in Eganville that are near tourist attractions? Are you arranging to spend time in Pembroke? 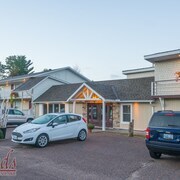 Hoping to book a hotel in or near Eganville? Downtown Eganville offers 2 apartments and hotels within 0.1 kilometres (0.06 miles). 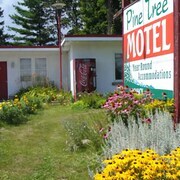 Canny travelers who understand the convenience of booking a hotel right in the heart of town will love the Pine Tree Motel and The Egan Inn, all of which are located within a 1-kilometre (0.6-mile) radius of Eganville's center. 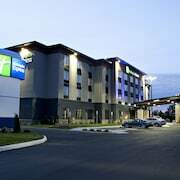 30 kilometres (18 miles) away from the center of Eganville, is the Holiday Inn Express Pembroke. Alternatively, the Best Western Pembroke Inn & Conference Centre is 30 kilometres (18 miles) away. Two more alternatives here include the Greystone on Golden Lake and the Goldenville cottage resort. Looking to venture a bit further afield? Ottawa - Southeastern Ontario offers many options. Ottawa - Southeastern Ontario has forests, rivers, streams and lakes. Popular Ottawa - Southeastern Ontario tourist draws are old towns and art museums. Common activities in this particular part of Canada include cross-country skiing. The nearest hotels in Pembroke include Petawawa and Killaloe. Petawawa is 40 kilometres (25 miles) to the north of Eganville, while Killaloe is 20 kilometres (13 miles) to the west. Petawawa accommodations include the Quality Inn and Suites Petawawa and Petawawa River Inn and Suites. The Sands on Golden Lake and Bonnechere Lodge are some of the hotels and apartments in Killaloe. Get your sports fix with a visit to Canadian Tire Centre, which is 95 kilometres (60 miles) to the east of Eganville. For visitors who are keen on sleeping close by, make a reservation in the Holiday Inn Hotel & Suites Ottawa Kanata or Fairfield Inn & Suites by Marriott Ottawa Kanata. Macdonald-Cartier International Airport is a nearby airport, and is located 110 kilometres (71 miles) from Eganville. Nearby hotels are Days Inn Ottawa Airport and Holiday Inn Express Hotel & Suites Ottawa Airport. 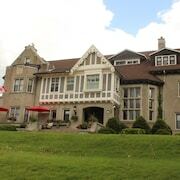 What are the most popular Eganville hotels? Are there hotels in other cities near Eganville? What other types of accommodations are available in Eganville? Explore Eganville with Expedia.ca’s Travel Guides to find the best flights, cars, holiday packages and more!